The use of genetic genealogy—in other words, DNA testing– has exploded in the past few years. Around the world, curious seekers are spitting into tubes and swabbing cheeks to help determine their heritage and find genetic cousins. Recently, three family members on my husband’s side have had sections of their genomes tested. The DNA test results were a mix of ethnic diversity from around the world: Native. Middle Eastern. West Asia. African. So where do these wide varying people groups converge to create the persons who become my family members? Family Member 1 (FM1) was given a 12-marker Y-DNA test via the testing company, FamilyTreeDNA. The results have been upgraded to the 67 marker level but are still pending. A Y-DNA test determines the findings on the direct paternal line only. The raw data from this test has also been uploaded to GEDMatch, a free service that allows for cross referencing of data uploaded from one of the three main testing companies to assist in finding genetic cousins. Mother and Family Member 2 (FM2) were tested via Ancestry.com, using their autosomal DNA test, which tests random contributions from both maternal and paternal sides (and provides data on ancestors primarily four or five generations back; not deep ancestry). Results have been uploaded to FamilyTreeDNA and GEDMatch. The results have proven to be a powerful history lesson. FM1: 79% European; 10% African; 7% New World; 2% Middle Eastern; 2% East Asian. 12 Marker Y-DNA ancestral origins: Bulgaria, England, Puerto Rico (1%), Romania, Spain. FM2: 68% European (breaks down as: 35% Iberian Peninsula; 13% Italy/Greece; 6% Great Britain). 15% Africa. 12% Native American. 13% other regions (including 4% Middle East). Mother: 74% European (43% Iberian Peninsula; 17% Italy/Greece; 14% trace regions); 14% Africa (6% North Africa); 9% Native American (including 2% West Asia). Puerto Ricans are largely the descendants of native Taíno Indians, Europeans (primarily Spaniards), and African slaves. Five hundred plus years of migration to the island and significant intermingling between these people groups has produced one of the most multi-cultural and diversified people in the Americas. According to the National Geographic Genographic Project, their reference population for Puerto Ricans breaks down as follows: 11% Native American, 31% Mediterranean, 21% Northern European, and 9% Southwest Asian, 25% sub-Saharan African. Other studies have found similar results, with European ancestry strongest on the west side of the island and African ancestry strongest on the east side. Consistent levels of Taíno ancestry exist throughout the island. Interestingly, however, more and more locals don’t relate to this genetic complexity. On the 2000 U.S. census only 4.2% of Puerto Ricans self-identified as “two or more races,” and 95.8% self-categorized into a single “race,” including over 80% self-identifying as “white.” In spite of this, it is estimated only about 25% of Puerto Ricans are of nearly pure European ancestry with little to no non-European admixture. This family of three persons whom I tested falls into this documented average reasonably closely. The lower percentage of native and African DNA in FM1 reflects the testing of the paternal line only. FM2 and Mother have higher percentages coming up through the maternal line, likely due to intermingling of indigenous women with Spanish and African males long ago. A review of the history of the island helps confirm where these admixtures originated. The largest indigenous Caribbean people on the island were the Taíno Indians, who originated in South America. The Taíno called their paradise ‘Borikén’ or ‘Borinquen’ which means “the great land of the valiant and noble Lord” or “land of the great lords.” The word, “Boricua” is still used today in various forms to designate the people from Puerto Rico. Hunter-gatherers who lived in small villages organized in clans and led by a chief, they were a peaceful group who lived off the tropical crops as pineapples, cassava, and sweet potatoes they grew, supplemented by seafood. 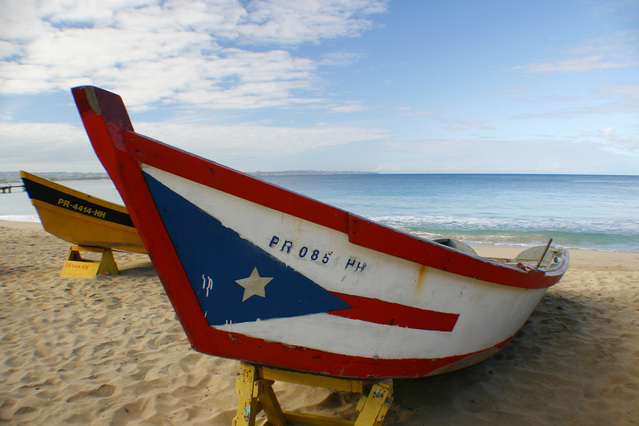 The European heritage of Puerto Ricans then begins with Spanish immigration to Puerto Rico. In 1493, Christopher Columbus set sail on his second voyage to the Indies. Upon arrival on the island and claiming it for Spain, Columbus named it ‘San Juan Bautista,’ in honor of Saint John the Baptist. Puerto Rico was now on a path of becoming a Spanish colony for nearly 400 years; thus, the primary European genetic makeup of most Puerto Ricans is Spanish (including primarily Canarians as well as Asturians, Catalans, Galicians, Castilians, Andalusians, and Basques). The Iberian Peninsula, the primary area of interest, is divided between four states: Spain, Portugal, Andorra, and France; as well as Gibraltar, a territory of the United Kingdom. The word Hispanic actually refers back to Roman Hispanis, which roughly comprised the Iberian Peninsula. Of course, today the term “Hispanic” refers to people of a country that speaks the Spanish language. It was to be the introduction of European diseases such as smallpox and cruel mistreatment that began the devastation and ending of the Taíno population. The natives were enslaved by the Spanish, to be used to build forts and work in the gold mines. Within two decades, though, the Taínos would be virtually wiped out. Today, traces of their physical characteristics are found in Taíno descendants clustered in areas of Borinquen. They left lasting legacies such as the musical instrument, the maracas, town names on the island- Mayagüez, Utuado, Humacao, and Caguas – and foods, such as barbacoa. There are numerous trees and plants still called by their original Taíno names. Before their demise, however, mixing of Spaniards and Taínos occurred. The Spaniards did not bring women on their first expeditions and took in Taíno women for their common-law wives. In fact, 1514 census records reveal that 40% of Spanish men on the island of Hispaniola had Taíno wives. Over time, mixed descendants of this group also intermarried with Africans, creating a tri-racial Creole culture. Beginning in the early 1500s, needing a new unpaid workforce, the Spaniards began the importation of enslaved West African slaves to work the mines. It is important to note, however, that black history on the island initially began with the Spanish Conquistadors bringing African freemen called ‘libertos’ with them years earlier. By 1570, the gold mines had been depleted so the production of ginger, coffee and sugar began as alternative crops. Sugarcane production is increased, thus greatly increasing the need for African slaves. From the very beginning, a large part of the identity and culture of the Puerto Rican peoples was tied to the African citizens now residing on the island. Africans have had an instrumental contribution to the art, music, religion, language, and heritage of the culture. One fascinating example to me is in the Puerto Rican form of Spanish. The West Africans brought to the island spoke a Spanish creole called “bozal” which was a mixture of Portuguese, Spanish, and Congo. The R and S sound did not exist in the African tongue and, still today, when Puerto Ricans speak, they drop the R and S sounds. History so far accounts for the Native American, African, and Iberian Peninsula components of the admixtures here being reviewed. But what about the next highest percentage in their admixture—Italy and Greece? How and when do these two countries come into the DNA picture? No one in the family tree of these three persons are known to have originated in Italy or Greece. However, it is known history that by the early 19th century Spain had lost most of its possessions in the New World, excluding Cuba and Puerto Rico. To encourage the immigration of Catholics not of Spanish origin to settle its Caribbean colonies, the Spanish Crown issued the Royal Decree of Graces of 1815, a legal order granting free land to settlers, as well as other incentives. Soon, considerable immigration of French (especially from the island of Corsica), German, and Irish families began, to be followed by smaller groups of Chinese, Greek, Italian, Dutch as well as others. Last, trace amounts of regional populations show up in the ancestral origins of these three test subjects, primarily Romania, Bulgaria, West Asia, and the Middle East. Some of these trace findings are just “noise”: too small of percentages to be verifiable as legitimate. But some of it is. Ancient migrations of people groups worked to disperse populations all over our globe. Possibly, the Middle Eastern contingency arrives from the spread of agriculture from the Middle East into Europe, which worked to also disperse Middle Eastern genetic patterns as these early agriculturists moved into Europe. But what about Bulgaria and Romania? How do these countries show up in these test genomes? I don’t know; however, a couple of months ago a gentleman with a very Anglo, “white” sounding first, middle, and surname contacted me via email. I’ll call him by his actual given name, Thomas. I read the original email, noting in my head that two surnames he mentioned researching and having in his family tree were strong surnames in MY family tree (which is 99.7% Great Britain). So, I fully assumed that the email was referring to a connection between his DNA and mine: that he and I were genetic cousins. It turns out that it was Thomas and the Hispanic FM1 who were originating from the same haplogroup. Thomas has several matches on his genetic match list with the same Hispanic surname as FM1; primarily the name ‘Cordero.’ This gentleman has no idea where the Hispanic component arrives into his lineage and, to date, I don’t either. Even more interesting was that the other DNA cousins that Thomas and FM1 matched were two Bulgarians! Shortly after the beginnings of our conversations, Thomas received an email from one of the men in Bulgaria. The Bulgarian ‘cousin’ noted that, though he too wasn’t sure how he is related to Thomas and FM1, “My ancestors (male line) lived next to a roman fort in old Dacia: Arutela.” He went on to suggest that the fort, built in 137-138 AD in Roman Dacia—regions of modern Romania–, had been stationed with Spanish soldiers. This just might be the answer as to where Romanian and Bulgarian trace amounts of DNA can be found in the bloodlines of FM1. Either way, it’s all quite fascinating. Really good… enjoyable reading. Thank you Mrs. Cordero!! Incredibly interesting and informative! I am half Puerto Rican and far removed from the island and its history, and these types of blogs are so valuable and helpful. You also have a lovely and understandable writing style. Thank you! I have not done my DNA yet but I have my ancestry done until my 3rd great grandfather. My 2nd great grandfather came from Corsica, France. Most likely my family leaving Spain during the Spanish enquisition of 1492. I believe that we have about 75% European, 15% Jewish, and a small Matrichrondial Native DNA. No Puerto Rican carries the Patrichrondial DNA from the Native Tainos as none of those males mixed and just like today most males of white, Asian, native blood don’t mixed. The rest will go with a watermelon if they let them. little humor. My husband and his various P.R.family members who have been tested (both paternal and maternal side) range from 43% up to 55% European. This was very interesting reading it gives me a lot to think about. I am Puerto Rican I am not sure why I relate my race with white, it is something I am trying to figure out. Can someone Reach Out confused about how much European DNA are Puerto Ricans comprised of. My husband and his various P.R.family members who have been tested (both paternal and maternal side) range from 43% up to 55% European. The only way that you will know for sure your ancestry is to get tested! Go for it! It is really not correct to write about the demise of the Taino people when across the island the autosomal percentages on average are between 15 to 23% with some individuals having none and some individuals having up to 39% indigenous ancestry. Over 62% of the total population has maternal indigenous haplo groups. The more correct term is assimilation or absorption by the on-going European populations. Domingo– Thank you for your comment. You are so correct and I appreciate your input! That is a more correct explanation of the situation. My husband and his family members range from 7-15% Native American/New World but I realize that many Puerto Ricans have much higher percentages. My father census have him as Native American . He was born 1914 . Are we as children have any Indian in our dna.